Do you have an area of interest that requires regularly updated imagery but you do not have time to check daily for this data? Or perhaps you have a remote location that needs updated imagery but you cannot afford a new collection? If either of these questions ring true, then you need to check our new Data Alert service on Image Hunter! 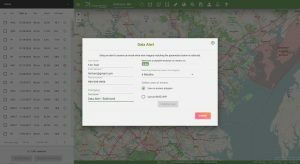 Data Alert lets you define an area of interest anywhere around the globe, the resolution your project requires and the number of months we should keep the alert active. Once this is set up, we check for new data over your area of interest every single day, and send you an email alert when we find coverage that meets your specifications. We have a short YouTube video with directions to set up a Data Alert, check out the second video. We also have written directions for Data Alert here. It’s that easy to find the data you need for all of your key projects. If you would like to check out Data Alert, send us an email at sales@apollomapping.com or visit Image Hunter and click on the bell icon in the header to get started using this great service! This entry was posted in The Geospatial Times and tagged data alert, The Geospatial Times, Tips & Tech by Apollo Mapping. Bookmark the permalink.